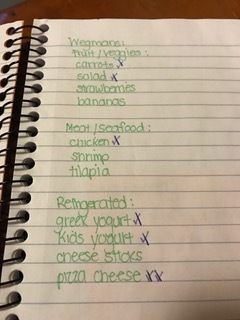 Who dreads creating a grocery list? I do! Every two weeks I do the shopping for our family and every two weeks I make the same list. A couple weeks ago I was on Pinterest looking for organization, budgeting ideas, new ideas for a new year and I came across a master grocery list and it has changed my life. I have used the master grocery list for a few weeks now and it’s amazing. 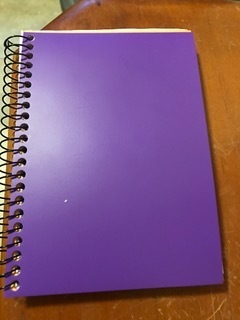 All I have to do now is make a dinner list and check what I am going to buy in my notebook at each store. Little Coffee Fox Inspiration Through Organization is where I found this wonderful idea and it inspired me to create a master grocery list too. This article is great and explains how to build a master grocery list. To get started, I just used a blank piece of paper and put down each store I shop at and put down the same categories for each store. Make the categories that work for your family. For example under Paper I put toilet paper, paper towels, plates, etc. For Personal I put deodorant, body wash, toothpaste, etc. Refrigerated I put cheese and yogurt, etc. On the blank piece of paper I was trying to remember everything I buy and go through the cupboards to try and remember everything. 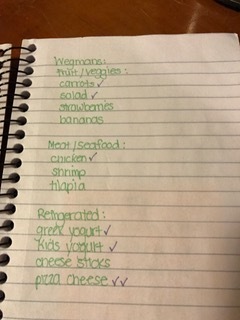 I did this list a week before my actually grocery shopping because when I remembered something I added it to the list. When I felt my list was complete I wrote it down in a small notebook with a pocket in the front for coupons. A bullet journal would be cool to make to! As I wrote my list I put the items in the order they can be found in the store. For example at Target I put personal, cleaning, paper, pantry, kids because thats how the store is set up. I also color coded each store. To figure out what I was buying at the store for each shopping time I put a check mark next to the item. I’m going to use a different colored check mark each time and then when I put it in the cart, I will x the check mark. For items on sale or items I buy every once in a while, I just add those items to a post it and put the post it in my book. 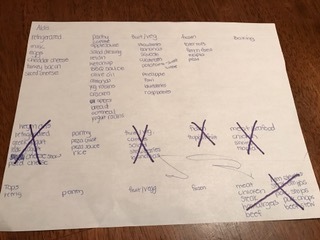 This master grocery list changed my attitude towards grocery shopping. I love shopping- window shopping, craft shopping, but food shopping stinks. I am no longer dreading "the grocery list". I figure once I run out of room for check marks I will have to rewrite the list, but I’m guessing I have a couple months before I have to do that. Happy Grocery Shopping!